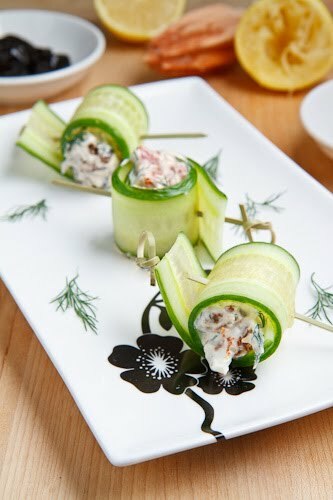 Cucumber rolls filled with creamy Greek yogurt, salty feta, sundried tomatoes, kalamata olives and roasted red peppers. With all of the decadent snacks that I have been testing out lately I know that some of you are wondering: “Are there any lighter options?”, and these cucumber feta rolls definitely fit the bill! When I first came across the recipe for these cucumber feta rolls on Good Life Eats I knew that I would have to make them and I have just been itching for the chance! A lot of my favourite Greek flavours are used in the cucumber rolls and they even kind of remind me of deconstructed and reconstructed tzatziki with the cucumbers, lemony Greek yogurt and plenty of fresh herbs. 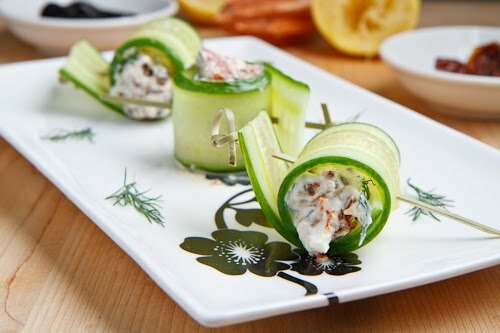 The recipe for these cucumber rolls is super easy and if you have a mandoline to cut the cucmbers thinly then it takes almost no time at all to make them. Really this recipe is more of an idea and once you have base of the cucumber, yogurt, feta and lemon you can finish them off with almost any flavours that you can dream up! I went with three different flavours; sun-dried kalamata olives with parsley, sun-dried tomato with dill, and roasted red pepper with oregano. Some other flavour combinations I was thinking of include spinach and dill for a spanakopita inspired version and a marinated roasted red pepper version where I would use white balsamic vinegar instead of the dark balsamic. I was also thinking that a smoked salmon and dill version would be truly amazing! Mash the feta into the yogurt and then mix in the sundried tomatoes, kalamata olives, sun dried tomatoes, oregano, lemon juice and pepper. Place 1 tablespoon of the mixture onto a slice of cucumber, roll it up and secure it with a toothpick. An elegant and flavorful appetizer! Yummy! It's like a greek tea time treat! Oh yummy. These sound like something I would love. I've just discovered your blog. You have some great recipe ideas :o) Thanks for sharing them :o) c x PS. Sorry, blogger will only let me comment as a pair of teddies! Wow, this look amazing. I am a huge fan of your 7 layer Greek Dip and these are now on my list of things to try! This will make a perfect healthy snack for tomorrow's night SuperBowl! You are truly an artist with you presentation. The cucumbers look so fresh. Fresh is so that way to go. As Elizabeth Berry so sagely said, shipping is a terrible thing to do to vegetables. They probably get jet-lagged, just like people. I am sure that after tomorrows super bowl party I will be in the mood for a lighter option. Cucumber is so light and fresh tasting. This bite size treat looks healthy and delicious! great idea! I like the light option! What a great idea, I have all of the ingredients in my fridge! But how light would they be if I didn't share and ate the whole batch. For dinner. 😛 I love greek flavors and these sound way more appealing to me than cheesy dips! What a great idea! I try to cut down on carbs and this is a delicious looking appetizer without the cracker, bread etc. Love it and will use it. In addition, it's gluten free yay! I am a new follower and have been really enjoying your posts. Love the lightness of them. Also for a change up you could use zucchini strips. These I just have to make! These are delightful and would make a wonderful treat anytime! Oh yum. To heck with Super Bowl parties… this sounds like a good daily snack! Thanks for the great idea. Cucumbers are the essence of lightness. It's a beautiful snack or appetizer. Like Janet, I think the combination of flavors is wonderful. The cucumber looks good in these rolls… A must try! Life in Mexico is characterized by a lot of sun and a lot of fried foods. I need and seek variation and you have some good ideas since veggies here tend to be cheap and fresh and a bit exotic. If you like hot, then you are also in a good place. Hi and wow! I just discovered your blog as I started to blog about food as well. Your dishes are artfully but easily to reproduce. And I really love the style of your pictures. I will definitely make those cucumber rolls. Love this! Can't wait to try these…you had me at Feta! I've pinned and zipped. YUM! Forgive my dumb question: how do you get the cucumber sliced so thinly and evenly? What slicer do you use? it looks delicious!! Healthy recipe, Kevin! Cucumber and feta are both great ingredients. I just look at the food pics on your blog and I get hungry. Leslie @ Cooks Quill: I used a mandoline to cut the cucumbers and that makes it super quick and easy to slice them uniformly thinly. More then your recipe I like the cucumber rolling. How did you manage to do that? Came here looking for a different recipe all together and found a few of yours on the blog that I know I would love.. and im hungry so i think I printed out a half dozen of them lol. Another great appettizer! Great combination of simple but delicious ingredients. Thanks for sharing!